Marti MacGibbon is a professional humorous motivational speaker, an award-winning author, and an expert on trauma resolution and addiction. She is an empowered survivor of human trafficking, PTSD, and addiction. January is National Human Trafficking Awareness Month, and Marti’s busy advocating and educating multidisciplinary teams of professionals about the issue, and about how to recognize and assist victims and survivors of human trafficking. On January 11, which is National Human Trafficking Awareness Day, Marti presented a Human Trafficking 101 training to healthcare professionals at St. Mary’s Hospital in San Francisco. 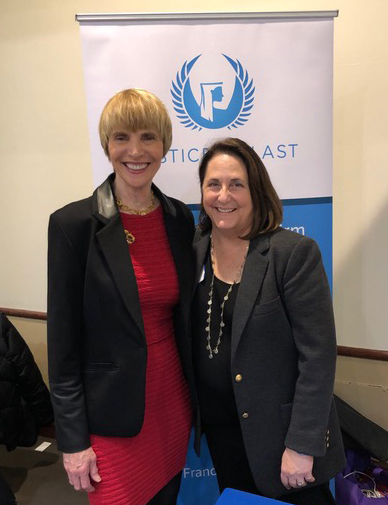 On January 15, Marti delivered the opening speech, “The Intersection of Human Trafficking and Addiction, with Focus on the Opioids Crisis”, at Sacramento’s 11th Annual Human Trafficking Conference at Sacramento State University. Marti also did a book signing featuring her two critically acclaimed and award-winning memoirs, Never Give in to Fear and Fierce, Funny, and Female. Ms. MacGibbon donated proceeds from book sales to Justice At Last, a non-profit headed by Rose Mukhar, a well-known California attorney advocate (and recipient of the Modern-day Abolitionist Award) who provides pro bono legal services to victims of human trafficking. Marti is a Survivor Advisor at Justice At Last. The Sacramento conference was organized by My Sister’s House, a non-profit serving victims and survivors of human trafficking, sexual assault, and domestic violence. On January 16th and 17th, Marti presented a series of trainings to healthcare professionals on trauma-informed care best practices for engagement with victims and survivors of violence. The talks were delivered at medical centers in Central Coastal California.